Predictions for employee engagement during the next decade. 20/20 Vision? What do you see as the future of employee engagement over the next 10 years? How will this concept and approach to work change during this decade? It would be nice to have 20/20 vision but the future is murky at best. It is a risky thing to try and predict the future but I will suggest a few of the changes I believe will occur in the next 10 years. Of course, I am biased and these are predictions I want to see occur. I encourage you to write your predictions in the comment section at the end of this post. Sociometers and wockets will trump surveys. Surveys are too anemic to measure and communicate engagement. Long surveys or once a year surveys will become the dinosaurs of engagement measurement. Yes measurement is important and necessary but doing a survey once a year just does not cut it. We will see real time micro surveys based on portable technology, GPS systems, etc. To get a glimpse of the future of human real time measurement see sociometers and wockets. Data will become more open and more linked. It will become important for data to become more transparent and open. I expect organizations will be less guarded, especially with their own employees. Employees should be the owners of the data they offer and be partners in assessing the results. To get a glimpse of the future of data (including employee engagement data) see Tim Berners-Lee, the inventor of the world wide web, TED talk on the next WEB – linked data. By the way, I love how at this site you can click on the interactive transcript, scan the transcript, click on any phrase and the video will play from that point on! Engagement will move beyond a fad. I expect engagement will vastly mature beyond happy dances in workplaces and Christmas party feel good exercises to specific behavioral actions that are of benefit to employees, organizations, and customers. We must always ask ourselves — engagement in what? Engagement in work, relationships, customer service, results, organization, etc? I believe the cynics would say employee engagement is a fad that will go away within a couple more years. I believe employee engagement is here to stay but will go through criticism, revision, refinement, and change over the next 10 years. We are seeing the word engagement attached to social media, student engagement, and many other phenomenon. Enterprise 2.0 or Social Business Software will accelerate engagement. The use of social media within organizations and porous to external social media outside organizations will present new opportunities and challenges. The first task for many organizations will be to fully engage staff in this media and then to ensure these tools are used to enhance both engagement and results. Internal social media must be an engagement gain for the organization not an engagement drain. Engagement will become more real and authentic. Employee engagement needs to be more robust, real, authentic, and honest. Trust is a must or employee engagement will be a bust. We have ways to assess authenticity and people’s social intelligence allows them to see through phony in about an 18th of second. Engagement will detach from a narrow focus on the role of employee. Employee engagement will need to detach the engagement part of employee engagement to more specific engagement. We will need to be more specific with such terms as work engagement, organizational engagement, community engagement, project engagement, , etc. Employee engagement is too narrowly attached to a role and can easily create an us/them experience in organizations with managers/leaders seeing themselves removed from employees. My preferred term would be work engagement but I am open to see how this changes. We will witness stronger independent research on employee engagement. This is vital and important. Hopefully Dilbert will not have just one cartoon lampooning engagement but Scott Adams will run a series over a week or two. Academics and universities can make great contributions to the field with their objective, scientific, and independent research. Consulting companies have too much of a vested interest in specific results to place our faith in their research. We need more controlled studies with experimental groups. Although employee engagement is not a fad there has been too much hype making it seem like a magic management panacea — rather than a key vital tool and approach to work. As a side note I would love to see best companies or employers not identified by consulting companies with vested interests in selling services to the companies they identify. The search for the single holy grail definition of employee engagement will be abandoned in favor of stronger behavioral and operational definitions of the term. Let’s drop the hope or search for one single definition of employee engagement. The MacLeod report found over 50 different definitions of engagement. Many writers seem to hunger for a common definition. I am not sure how important this is, and there are benefits to diverse definitions in the early years of this approach to work. I think we need more operational definitions of engagement so we know specifically how people are defining it rather than all of us defining it in the same way. For example, what is the specific score and questions that determines if an employee is placed in an engaged or disengaged category? We don’t all need to agree but we do need to understand fully how the term is being used. We still have not agreed on a common definition of love and love has been around a lot longer than employee engagement. Engagement levels will increase. People are focusing on it, organizations are measuring it, managers are addressing it, unions are assessing it, individuals are enacting it. This is not so much a prediction as it is my full intention and application to play a vital role in the increase of employee engagement worldwide for the benefit of all: employee, organization, managers/leaders (who are also employees), customers, and all other stakeholders who have a role in work including the families of employees. Engage along with me, the best is yet to be, let’s see not only where we end up in 10 years — let’s fully engage in our work to make it happen. David Zinger, M.Ed., is an employee engagement writer, educator, speaker, coach, and consultant. He offers exceptional contributions on employee engagement for leaders, managers, and employees. David founded and moderates the 2100 member Employee Engagement Network. His website offers 1000 posts/articles relating to employee engagement and strength based leadership. David is also very involved in the application of Enterprise 2.0 approaches to engagement and the precursor, engagement approaches to Enterprise 2.0. The efforst driving employee engagement and your network being a big part of it, are definitely bound to expand. I like your vision here of what may change but I’d like to hear more on the vision of the results due to that change? Surely you have more to add on that? I suspect that workplace measures begin to focus on engagement instead of individual performance and that knowing more about your colleagues and teams becomes part of our job descriptions, instead of a luxury at select companies. You offer an excellent request to focus on the results. As I see employee engagement primarily as connection to many factors I expect the results will be individual and collective. Enterprise 2.0 is certainly offering the chance to enrich connections online while facilitating better connections in person. The organization will become a community and HR will become community mobilizers. While doing this we need to keep our eye on the prize…own the podium, or whatever 1 to 3 results the organization is focused on accomplishing. 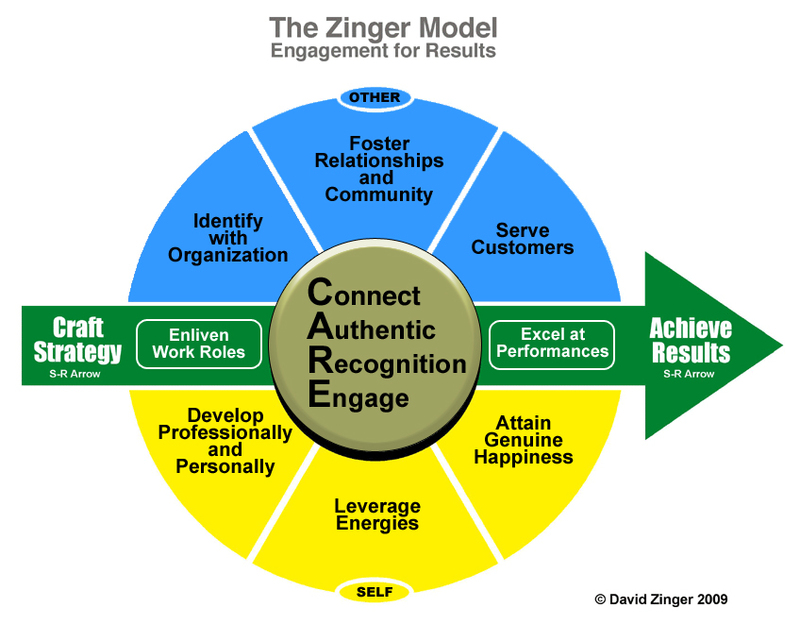 I will be writing more about this as I expand the Zinger model. I love your vision David! I have to agree with you, the importance of employee engagement isn’t going anywhere over the coming decade. I’ve shared your vision with my readers in my weekly Rainmaker ‘Fab Five’ blog picks of the week (found here: http://www.maximizepossibility.com/employee_retention/2010/02/the-rainmaker-fab-five-blog-picks-of-the-week-3.html) to cue them in on your vision for the coming decade. I like your vision on engagement. What do you see as the future required leadership skills that should lead to an embedded engaged corporate culture? Great question and I realize that I should probably write a post on this not a comment. So I will in the near future. For now I think there is now way to engagement, engagement is the way. Leaders, and isn’t that everyone in the organization, must engage and energize themselves, take full responsibility for their own engagement, and be accountable for everyone else’s engagement. We need to really see people, connect strongly with results, and demonstrate robust caring. Great list, some are interrelated, others are more outcomes of other points. The cream that rose to the top for me is dropping the search for the Holy Grail One True Definition and focusing on behavioral and operational definitions (AMEN!) to which I’d like to add “and meaningful results”. Part of what will help that along is: Engagement will be woven into the fabric of management and tapestry of leadership. If there are meaningful results identified, as has been said many times, it will only hasten the weaving process!